Not everyone has the space, or indeed the spare couple of grand, needed to accommodate a 5m tall jubilant bronze woman in the back garden. In truth those that do are in the minority but this need not exclude us plebs from enjoying art in the garden. By reducing the proportions to suit the size of your estate it is easy to use sculpture to add an extra dimension to any outside space, be it public park, domestic garden or backyard, be it fishing gnome, Henry Moore or Rodin. 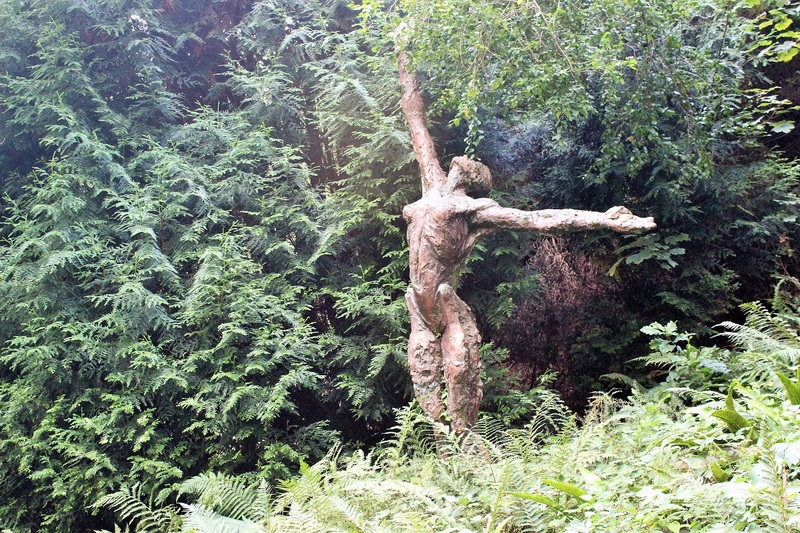 Somewhere to gain inspiration (and eat chocolate brownies) is Broomhill Art Hotel and Sculpture Gardens, near Barnstaple in North Devon. This late Victorian building perches above a wooded valley and is the artistic equivalent of a packet of M & M’s, every flavour you could ask for: realistic, bizarre, thought provoking, amusing, puzzling, constructed of wood, metal, resin and even recycled plastic bottles. Anyone who fails to find something to please here is beyond hope. In the Hotel gallery there are smaller items, paintings, ceramics and prints (and chocolate brownies). This Carol Peace creation is my fantasy purchase and I remain optimistic that one day I will own it. Foolish, undoubtedly, but I am an advocate of Think Big! In the meantime I will continue to visit this special place to dream and eat the wonderful chocolate brownies. ps They do serve other food, all of it delicious! Marvelous! Can’t you just feel her rising above her ferny captors and declaring her independence? I hope you get it someday. How did you know that brownies were rising in my oven at this very moment? A great description Kayti, she is wonderful, but if I can’t have her there are others ……. Actually we have some small pieces by the same artist, she has a website http://www.carolpeace.com/ I would be interested to know what you thought (you being a professional!). Hope your brownies were good, I can almost smell them! Love that piece of joyous amazonian sculpture. Wouldn’t that be wonderful to own…just a lottery win needed now! Glad you like it too, I would rather spend my money on her (if I had any) than a flashy car! I love visiting gardens with or without sculpture but preferably with chocolate brownies, I’ll try to visit this when I’m next visiting the UK.